Spring is here, so summer can’t be too far away. 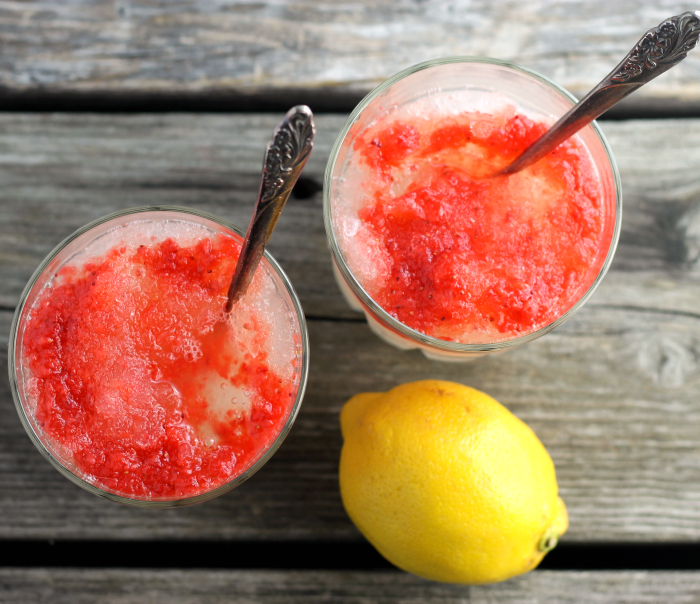 Yeah, it soon will be time for lemonade… like this lemonade strawberry slush. Happy April 1st or also known as April Fools’ Day. Did anyone pull an April Fools’ joke on you today? I was lucky, I got through the day without any jokes or pranks pulled on me. 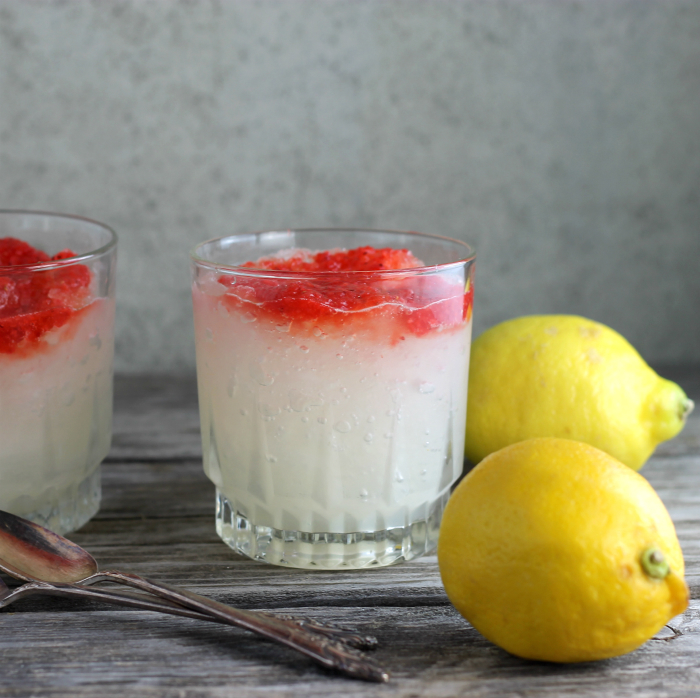 April 1st means that the weather will soon be getting warmer, the grass will be turning green, before too long we will be planting things in our garden, and it will be time for cold summer drinks, like lemonade or in this case lemonade strawberry slush. I may be jumping the gun a little bit with this drink; it was kind of a cold windy day today. Not really a day for summery drinks, but then I guess drinks like this are good year round. Do you drink lemonade year round or do you save it for those warm summer days? My daughters like drinking these drinks year round. Actually, this is one of the reasons that this recipe came about. I had some strawberries sitting in the refrigerator and didn’t really know what I should do with them. I thought about making a dessert with them, but with Easter just behind us, I really didn’t think we needed to have more sweets in the house. The more I thought about the strawberries the more I thought about making a lemonade slush and adding the strawberries to the slush. Technically, I guess it is more of a lemonade slush with some strawberries added to the slush, but I like the name lemonade strawberry slush, so I will stick with the name. Also, the strawberries add sweetness to the tartness of the lemonade, yum. I made sure to make the slush on an evening that at least one of our daughters would be home. I really wanted their opinion on the lemonade strawberry slush, since they are more of an expert in this area. It was a hit. In fact, everyone loved it. 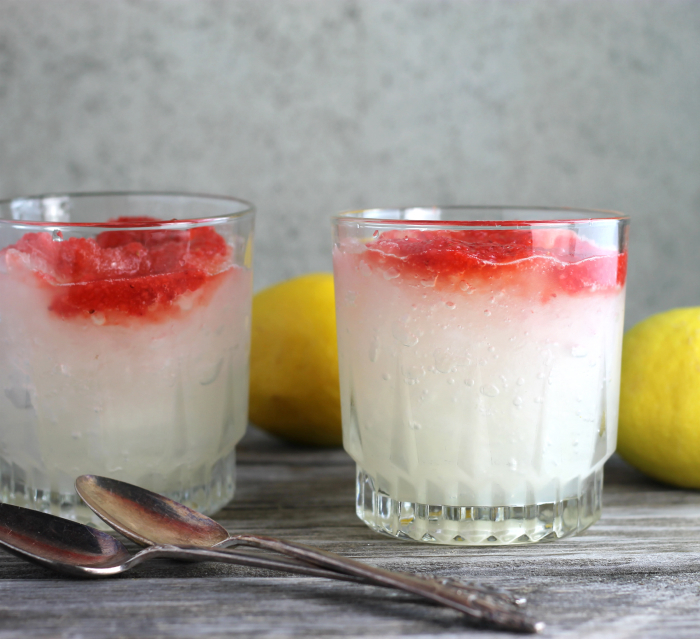 This lemonade strawberry slush will be on the list of things to make when the weather is hot and we need something to cool down with. In a large container add 8 cups of water. Gradually add the lemon juice. I gradually added the lemon juice until it was to my liking. Remove 2 1/2 cups of the lemonade and place in the refrigerator. This will be used when making the slush. The rest of the lemonade place in the freezer and freeze until completely frozen, about 6 to 8 hours. Before serving mash the strawberries with a potato masher or run through a food processor or blender. Stir in the remaining 1/4 cup of sugar or to taste. Set aside. When serving remove the frozen lemonade from the freezer ahead of time to thaw slightly. 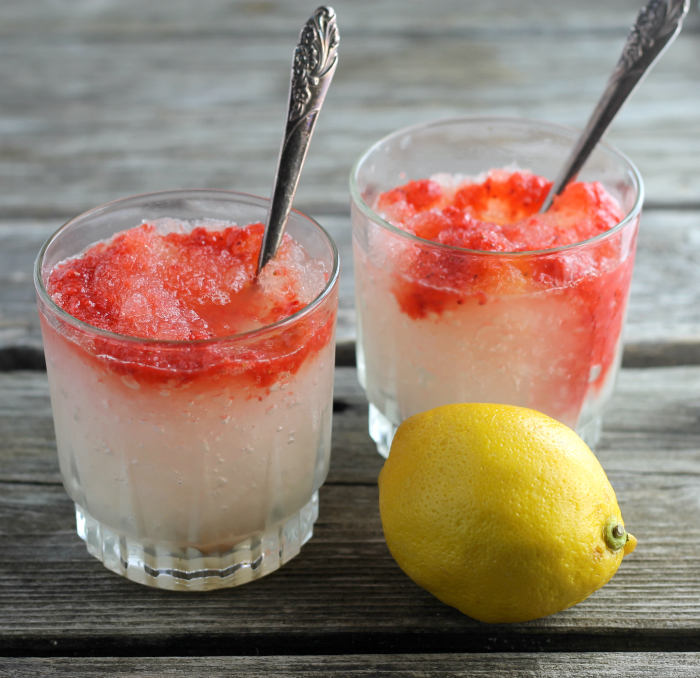 With an ice cream scoop scrape the frozen lemonade and place in a glass. Pour a small amount of the reserved lemonade. Top with a scoop of the mash strawberries, they can be blended in if you like. That looks so beautiful and delicious. Lovely clicks! A perfect treat for hot summer days and I love the colour! There was a fast-food place back in the south that had a strawberry lemonade slush. I would sometimes drive through on the way home from work just to get a slush. It was that good! This totally reminds of that one…and it totally reminds me of warmer spring days! Hope you guys had an awesome weekend, Dawn! I really love this drink! Looks so refreshing! 🙂 Love the color too!